Good Monday all , happy family day in my neck of the woods and happy president's day for those who celebrate . Hope you guys have a great day off . I have a good book for your reading pleasure today . MARIBELS DECADENT MINATURES by Theresa Sederholt . 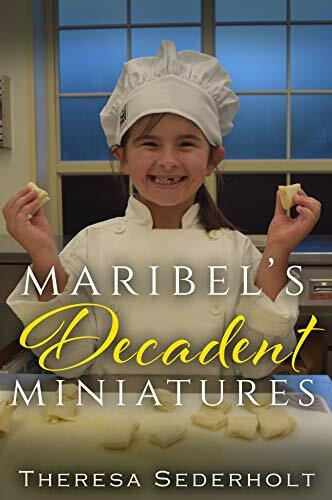 Welcome to Mescalero New Mexico , where Rayden Cornell ends up to get the rights to a photo that he has purchased to promote his on line baking store Maribel's Decadent Miniatures. When he and his best friend come in contact with Dani Bernard things start to change . When Elan has a reaction to the town and Dani he must try and remember his past Rayden needs to come to terms with something that has never happened to him before . Falling in love with Dani . Will everyone be able to over come the past and have the happily ever after that each of them deserve. When I sat down to read this book I was hoping I would like the characters . I really did love these characters . Rayden is kind of a as they call him in the book a Ralph Kramden . If things didn't take off in 6 months he was on to the next thing . He was kind of a drifter still living at home in his parents basement . Until the day he decides to grow up and take a chance . There were a few times you really just wanted to slap him upside the head cause he was just being a dork . Overall he is actually a lovable guy that you will love to hang out with him . Elan is Rayden's best friend and he is the for a lack of a better word the angel on Rayden's shoulder , he keeps Rayden on the straight and narrow sometimes . He is a sweet but there is a sadness to him that when he gets to Dani has memories rush back and he realizes that there is more to him then his parents have told him . I really like Elan he is a complicated man and so want to find out more at him. Dani is a sweet woman who has been through so much in her life and she just wants to help young girls that are special like she is When you find out she is a medium and her two best friends are werewolves . She is also very strong and independent .